My personal frustration with our local school board hasn't improved since I made this earlier post. In short, it's a group of people who somehow feel they're accountable to no one. They need to be voted out. I did what I could to vote out the one incumbent who was up for re-election last month but it's clear there are too many cronies who will continue as board members because their terms aren't up...yet. There's a new development in the district that will give this board a chance to redeem itself. It seems a group of teachers at one of the junior high schools is unhappy with the management and leadership style of their principal, Shari Switzer. Just by coincidence, my youngest daughter currently attends that school and I've heard Ms. Switzer speak. I've also exchanged a bit of e-mail with her over the past year. Why? The first time I heard her speak (at an orientation session) I was so impressed that I wanted to thank her for being such a passionate, caring school administrator. I've never reached out to any other teacher/principal like this in the past, so that should give you an idea of how much she wowed me (and much of the rest of that crowd) at that session. It amazes me that teachers can gang up like this and put pressure on a superior. Wouldn't it be interesting if it worked that way in the business world?! It would be one thing if there was truly a problem buried in all this, but based on my personal experience and what I've heard from other parents, this is an unfair criticism of one of the best administrators in this school district! HSE School Board Members: Please show some spine on this one and support this outstanding principal. Anything short of that would be yet another failure by the entire board, and the third in the last six months. Warning...political opinions appear throughout the following book review. If you're likely to be irritated by the discussion of politics in this previously politics-free blog, don't read the post below. And please, no "gee Joe, why did you have to go off on a political tangent like this? I used to like your blog..." comments. You don't have to read this! Consider yourself warned. After reading John McCain's Faith of My Fathers a couple of years ago I thought I'd found my candidate for the 2008 presidential election. But as the war in Iraq has dragged on I've become increasingly concerned that McCain will be more of what we've already had too much of over the past 7+ years and, without sounding too cliche, it's time for a change. Btw, that's coming from a guy who twice voted for George W. Bush...a decision I've grown to deeply regret. 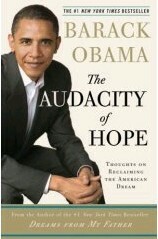 So how about Obama's The Audacity of Hope? Has he won me over through his New York Times bestseller? Not necessarily. As I read this book I could see any of the candidates saying much of what's presented here. I didn't find any one thing that jumped out at me as the key reason why I absolutely must vote for Obama. The book is well written and I feel it gave me a glimpse of the man, his life, family, etc., but I'm hard-pressed to say it's a vote-getter. Obama is clearly an extremely bright man and I'm in tune with his thoughts on investing in education, technology and a health care system that provides for the needy. Then again, who wouldn't be?! If you close your eyes and think about it, doesn't that sound like any one of the other candidates talking...from 2008, 2004 or perhaps even earlier? To be fair, the book was originally published two years ago and the political landscape has changed a bit in that time. Anyone interested in studying Obama's stance on the latest and greatest issues would be better served by visiting his website or following his blog. P.S. -- At this point, Obama probably has my vote. But that's as much the result of my lack of interest in the other candidates as it is my heartfelt support for Obama. While that's not exactly a ringing endorsement, I don't think he'd be any worse than the guy I voted for the last two times.